There are many threats to birds in winter. Most weeks recently I have seen at least one bullet-like Sparrowhawk chase zooming through the bird feeding area, occasionally getting lucky. The cold weather itself must take its toll, particularly on smaller birds. So I was curious when I found a dead chaffinch (Fringilla coelebs) lying by the French windows, as to the cause of its demise. Initially I thought it had flown into the window, but the curtains were still drawn making that unlikely, as well as there being no tell-tale feathers or marks on the glass. Our cat had been out for an early morning stretch, but normally she carries back her prey to the front door and at least has a go at eating some of it. I picked it up to dispose of the bird, and noticed how badly affected the legs and feet were; grotesquely disfigured with extensive wart like growths. On one foot there was only one visible claw remaining, which made me wonder how it could perch and move about without significant inconvenience. Otherwise the bird seemed perfectly normal. I have seen this before in Chaffinches, often seeing several affected individuals in the same area. 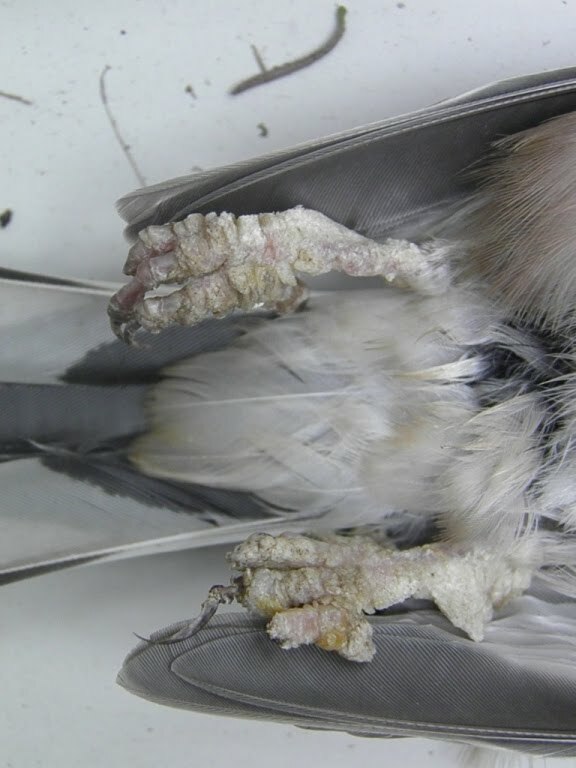 The condition is commonly referred to descriptively as ‘fur foot’ or ‘bumblefoot’. 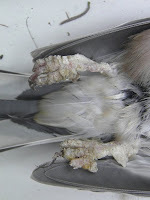 According to the website http://www.ufaw.org.uk/infectious-diseases.php#id11 similar deformities are often caused by the Fringilla papillomavirus (FPV), which as you can see by comparing the Latin name of the Chaffinch is associated with this bird and to a lesser extent the closely related Brambling (Fringilla montifringilla) with which they often mix. It is this flocking behaviour of these birds in winter that probably aids its dispersal to give high local infection rates. The condition is not too dissimilar to human warts, with excessive growth of skin. From some quick website research people frequently report seeing chaffinches behaving relatively normal despite varying degrees of such malformation. Indeed the http://www.ufaw.org.uk/ link states that the condition can actually spontaneously disappear. However, it must put affected birds at some disadvantage and it is probably a wise precaution to reduce spread at concentrated feeding areas such as bird tables, by occasionally cleaning with mild disinfectant and moving their location (note to diary). 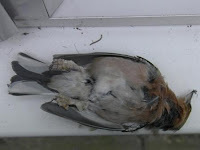 Returning to our crime scene by the French windows, we might surmise now that the Chaffinch was probably more likely the victim of our cat, rather than from a sudden death syndrome. Was ‘Purdey’ put off by the warty legs, or just too lazy to bring it to the door? Whether it was a cat attack or not, it is a useful reminder to refit Purdey’s collar with its warning bell!